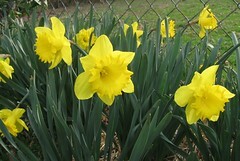 The backyard has its array of daffodils. The tulips are popping up and so are the wild onions in the yard. Previous Previous post: Um…I’m not on this list.